How Is a Cat Declaw Surgery Performed? Whether it is inhumane to declaw a cat is a heated topic. Many countries ban the procedure, but the U.S. allows veterinarians to perform it. The decision to declaw your cat, especially a cat older than 6 months, should not be made lightly. Being informed and discussing the pros and cons with your veterinarian is helpful for the decision-making process. The intent of this article is not to endorse declawing, but rather to provide information about the techniques commonly used. 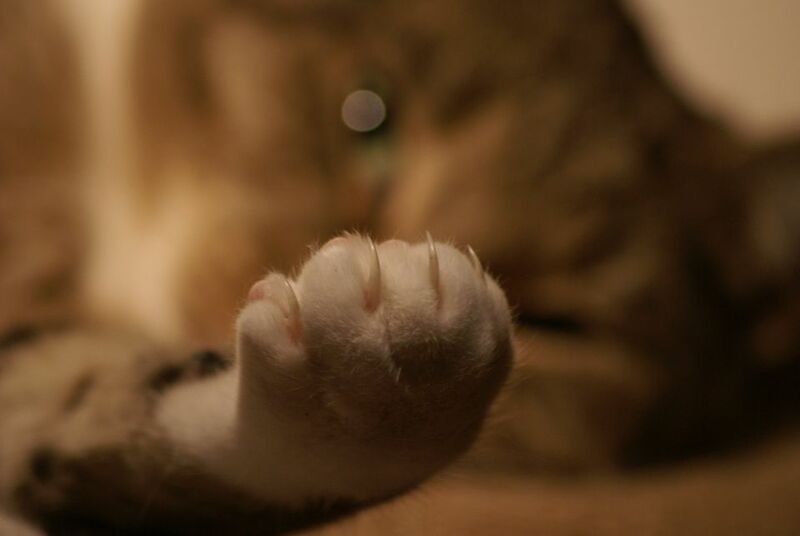 There are only a few medical reasons to declaw a cat—a tumor or a badly damaged paw. Most declawing is done because a cat is damaging the furniture, although some are declawed because their owners have suppressed immune systems and can't risk exposure to bacteria from a cat scratch. The cat claw extends from the P3 bone, and it is analogous to the human fingernail extending from the tip of our finger.It may surprise some people to learn that there are several ways to declaw a cat. Excisional method - The excisional method removes all of the last bone (P3) of the toe using a scalpel or laser. The excisional method is most commonly done using a scalpel blade. Some vets use lasers and report less hemorrhaging. Guillotine method - The guillotine method cuts through the last bone (P3) of the toe, typically done with a nail clipper. This method removes the claw and distal (end) part of this bone, sometimes cutting through the toe pad as well. The excisional method takes more time and thus may cost more. Cutting through the bone using the guillotine method can create a more painful recovery for your cat with more possibilities for complications. A third technique, a ​Deep Digital Flexor Tendonectomy, is not technically a declaw, but a surgical procedure in which the tendons that operate the claw are cut, leaving the claw intact. This is to prevent the active use of the claws. Care must be taken after this procedure to keep the nails trimmed so they do not grow into the pad; the cat no longer has control over the claws. The problems that occur with your cat after declawing may eclipse the problems you had before having the procedure done. The procedure is painful, and the pain lasts for a long time. Some cats have phantom pain for the rest of their lives. Some cats don't use the litter box reliably for weeks following surgery because the litter hurts their paws. A declawed cat that lives or regularly goes outdoors is helpless without its claws. A declawed cat is also at a disadvantage in a household with other pets. Some cats become aggressive and start to bite when they no longer have their claws for protection.